A new high-capacity, aftermarket-manufacture Magazine for your Hi Point 9mm 995 / 995T carbine rifle. Sturdy-made of blued steel, ready for reliable firepower to the tune of 15 rounds. ProMag magazine bodies are constructed of high carbon heat-treated steel and TIG-welded for strength. The springs are precision wound using heat-treated chrome silicon wire. Bases and followers are injection molded from polymers selected for their durability. The result is quality, consistency, durability and reliability. 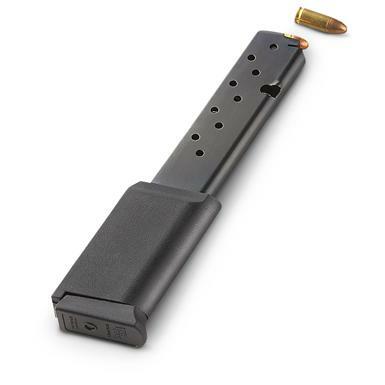 Aftermarket Hi-Point, 9mm Carbine Magazine, 15 Rounds is rated 4.2 out of 5 by 134. Rated 1 out of 5 by ArloG from Rounds jam I purchased 2 of these a while back and both give me bullet jams after about 3 rounds. Rated 3 out of 5 by GottaShootAlot from Sorely needed extra rounds. Bought one of these several years ago. It would not feed properly, so I figured out why, it was not seated far enough into the mag well. A simple minor grinding of the top of the mag with a dremel fixed it. If you have any of the older ones you might try this. I'm really glad it seems the new ones work as stated, might buy one as I like the extra capacity. Rated 5 out of 5 by Hot rod from Great price Good fit, works as good as original mag. Rated 1 out of 5 by sicpup4life from Never seen so many jams I bought 2 of these mags for use with a brand new rifle. We loaded both mags with the same ammo as the 10rd mag that came with the rifle. Every round jammed on both 15rd mags. Thats right every single one. I put the stock 10rd clip in and there was no problem firing all ten rounds . So we retried 1 of the 15rd mags again same thing happened. Rated 5 out of 5 by Bailey Hillbilly from Good design, functions fine. The cut and spacing at the top of mag matches the OEM models and despite a warning not to use by MFGR I tried this and it works fine. Do not see how any "feed ramp damage" could occur at all which is what is warned against and "not covered under warranty". Besides, I like the straight stick design.